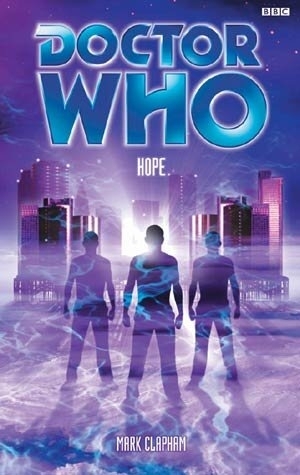 Hope is a novel on BBC books, and it features the Eighth Doctor, Paul McGann, and the characters Fitz, and Anji, and is a story about The Doctor unravelling a local political intrigue. The novel, which is the bases of a Dr Who episode, was first published in 2002, written by Mark Clapham. The story begins with The Doctor trying to push the TARDIS to its limit, when the crew finding themselves on an inhospitable planet, due to the TARDIS breaking up, and it lands on a frozen sea of acid on the planet Endpoint, in the distant future. As the ice begins to break they flee to the nearest city of hope, only to see the TARDIS sink to the bottom of the sea. In Hope a policemen, who’s investigating a decapitation, explains that the planet is toxic, so the inhabitants have had to evolve to survive, but recently a serial killer has been decapitating people. The policeman tells them to go to the casino for help, and when they arrive The Doctor buys entry with an apple core, which is long extinct. Inside the casino a group of cyborgs calling themselves the Brotherhood of the Silver Fist, burst in and demand that the casino’s owner, Silver, speaks to them. Silver, a cyborg himself, drive the brotherhood, out, but as he finds out from The Doctor that he’s a time traveller he offers to recover the TARDIS if The Doctor catches the murderer. (There are lots of uk casino games online to play, including roulette, slots, and blackjack, to get the experience of being in a real casino. Betway are offering a welcome bonus, on the first three deposits for new players, with big win jackpots to be won). The Doctor finds a used tranquilliser dart at a crime scene, and deduces that the murders are part of a plan committed by a visitor to Endpoint, and he also learns that the inhabitants produce a hormone, which is similar to the effects of adrenaline. The Doctor is overpowered and is then held in a bunker on the sea bed, and Silver attacks the bunker and kills the humans. Whilst in the bunker The Doctor and Silver find technology capable of reversing the pollution, and when activated the sea turns into water, and the air becomes breathable again. There’s a hypertunnel in the bunker, which can be used to quickly travel throughout space, and Silver flees through the hypertunnel, which then gets reprogrammed to leave Silver and his army stranded on a dead planet. + Hope is Out Now, priced £4.99. Review: Special Releases - [Eighth Doctor Box-Set 1] - Dark Eyes - CDDoctor Who: Dark Eyes, The Eighth Doctor, Big Finish Audio CD Review for Doctor Who Online.Review: Gallifrey: Intervention EarthGallifrey: Intervention Earth - Big Finish review for Doctor Who Online.Review: Early Adventures 1.1 - Domain of the VoordDomain of the Voord - Big Finish review for Doctor Who Online.